Photo by Susan Russo. Victoria Davidson, Karen Kemeys, Candy Shirley, and Robin Kalinich successfully negotiate one of the hills in Enchanted Forest. 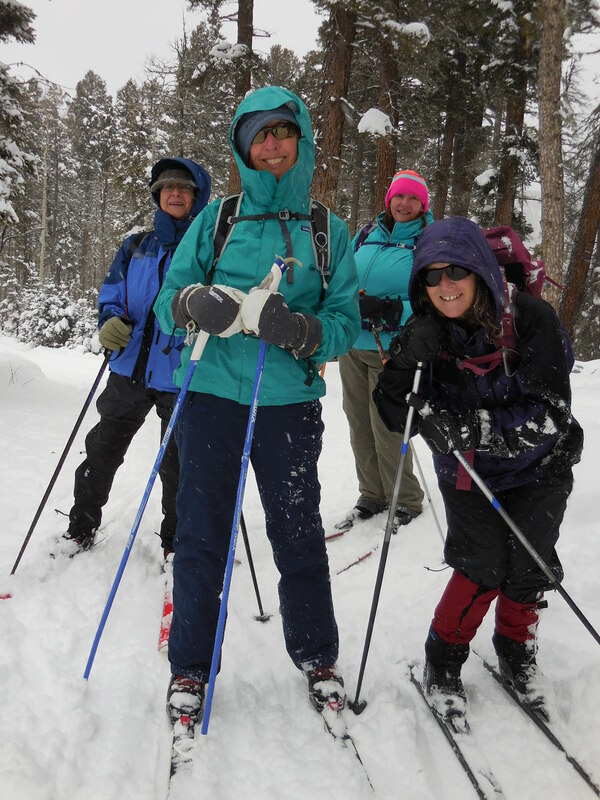 Susan Russo led a group of about 15 skiers to the Enchanted Forest for the final "test" of the Beginner Instruction Program. While only a few of the skiers were beginners, those that were experienced some of the best skiing and snow conditions of their short skiing careers. Contrary to the weather reports, the Friday ride up to Red River had no snow on any roads all the way. So everybody woke up Saturday refreshed and ready to go with a snowfall of several inches of fluffy new snow to ski on. 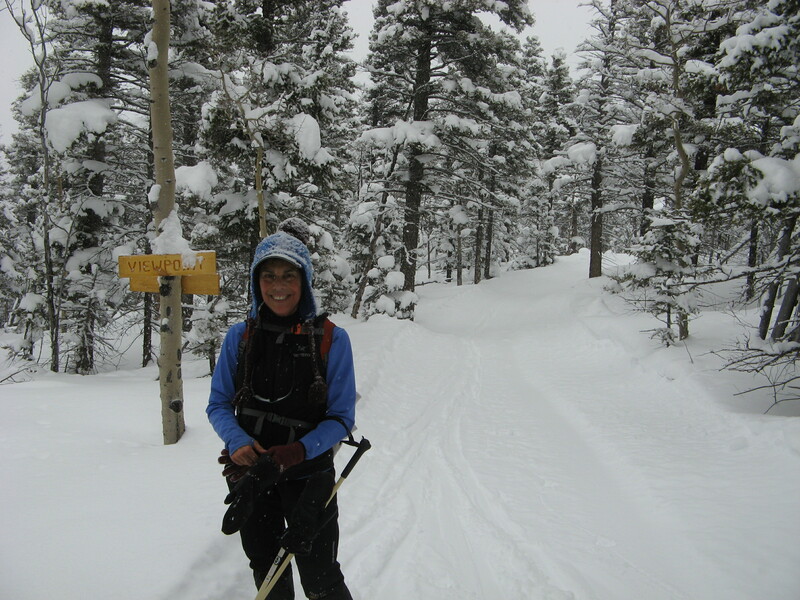 The Enchanted Forest is an extensive Nordic ski area about 3 miles east of Red River near Bobcat Pass on NM38. They have a normal rate of $18 to ski all day, $12 over 62 and free oer 70. But the group rate is $12, $10, or free depending on your age. They have 10s of kilometers of groomed trails as well as snowshoe trails and 5K of dog trails to explore. The added bonus this weekend (Feb 27-Mar 1) was that this weekend was their Just Desserts weekend, with goodies from many of the local restaurants and specialty shops available for a single price of $10. And the proceeds goes to a local charity. Photo by Susan Russo. Victoria Davidson, Karen Kemeys, Robin Kalinich and Candy Shirley celebrate their skiing success. 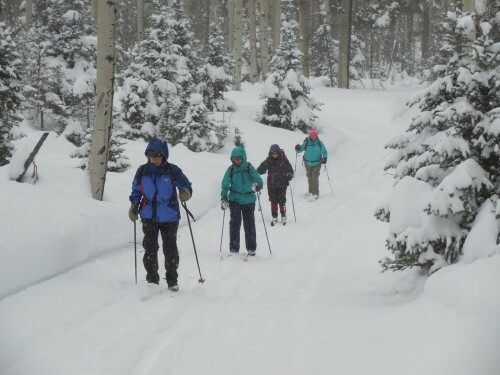 The snow was some of the best snow we have had all year, and it provided an opportunity for skiers of all levels. Especially the new skiers learned that they have a lot more skills than they imagined. It was both enchanted and magical around the area while we were there. There were surprisingly few skiers in the area during the day, probably because the amount of snow during the previous night made it a little difficult to get to the area. But the snow during the day made our ski a kind of fairyland experience. Most of the trails were nicely groomed, although the snow was so hard that the traffic and the groomers weren't able to keep up, so there was a nice fresh snow cover over the trails. Photo by Susan Russo. 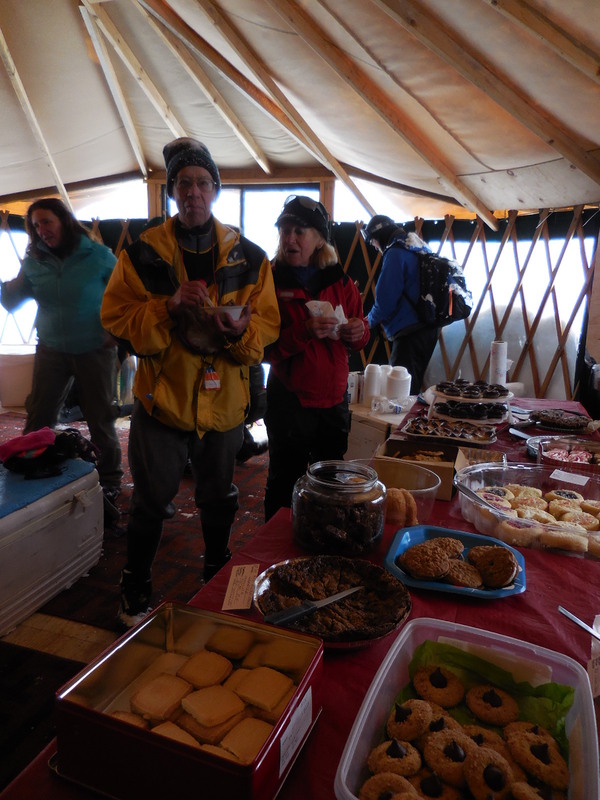 Robin Kalinich, Wayne Kirkby, and Phyllis Pryor prepare to attack the desserts in the day use Yurt a few kilometers from the Base Camp. In the mean time, everybody looked forward to the Just Deserts event for our sugar high. The desserts would have kept everybody busy enough without the skiing, but we had to pinch ourselves to remember our reason for being there: cross country skiing. So it was back to the trail for more skiing. The best, most interesting route was around the entire perimeter of the ski area: up NW Passage, around the far end by the rental yurt, then back along the trail called Jabberwaki. The distance was around 7 to 8 kilometers, but the conditions were so good that nobody really noticed it. It was a great trip. And you should have been there. Great snow, great fun, great friends. Photo by Ray Berg. Sybil Kyser shows her satisfaction with the ski conditions and getting to the far point on the trail.